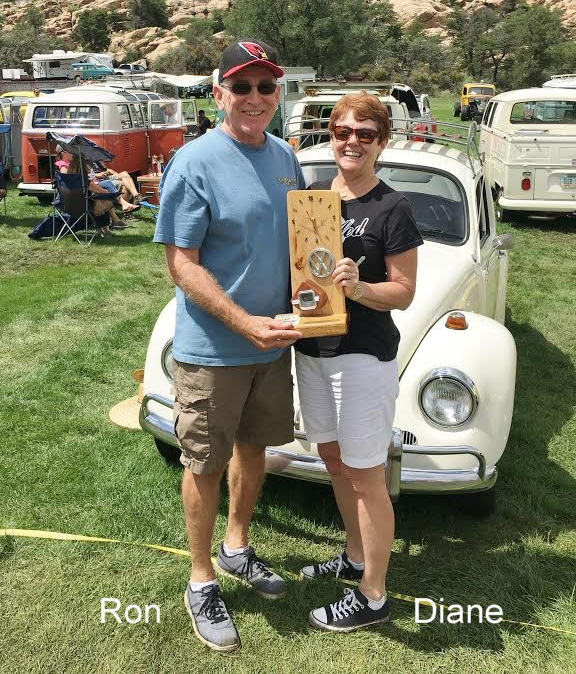 Ron and Diane Waller of Phoenix, Arizona not only are loyal Readers of 1967beetle.com, Ron has contributed several articles to the Site. Earlier this year, the Wallers decided to drive their 1967 Lotus White Beetle with many other air-cooled Volkswagens on the 19th Annual Treffen Border-to-Border Cruise. Their Journal memorializes the notable trip from Washington State to the tip of California. Drive along with them as they revive that feel-of-the-road Volkswagen experience. About four years ago, my wife, Diane, and I heard about the “Border to Border” Treffen. Treffen is the German word for trip or journey. Little did we know the word also could be used for “adventure,” because indeed it was! Treffen starts in Port Angeles, Washington, and cruises down the coast on Highway One or U.S. 101. It lasts ten days and finishes at Border Field State Park at the Mexican Border. This was the 19th year for the event. Total mileage is 1,700. We decided it was something we had to do. From that point every decision we made concerning work on the car was made with Treffen in mind. One of our major concerns was how “laid back” the trip was. 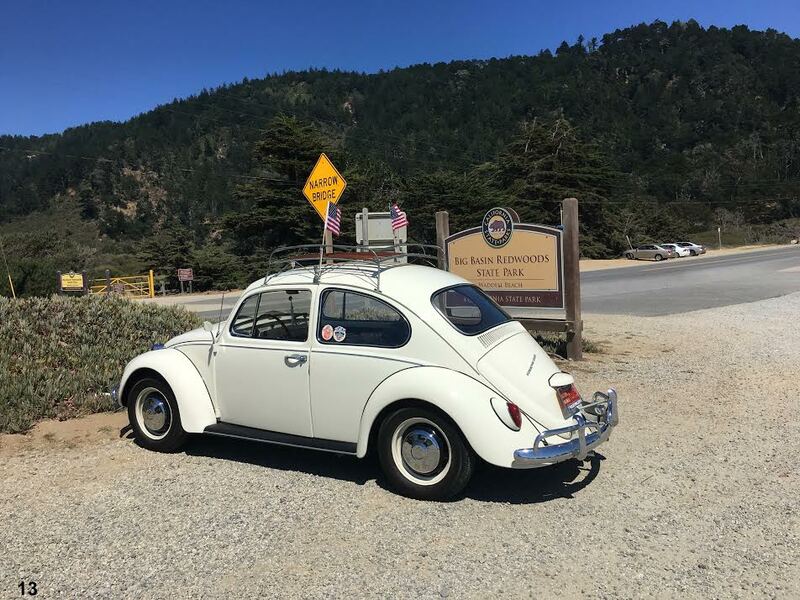 The only requirement was an “air cooled VW.” There was no registration or fees. You came and went as you wanted. Being a very organized “Type A” personality, that was a real challenge for me. We also decided to ask our best friends, Dan and Becky Lehman to accompany us. They have a beautiful 1971 Super Beetle. Needless to say, a great deal of planning and effort went into this adventure. First, we decided to ship the car to the starting point of the cruise. If you have shipped a car you know the anxiety that goes into this! The car left Phoenix three days before the start of our trip, which would begin on July 20. We had it delivered to Vancouver, WA, in time for our first Treffen day. When we left Phoenix, the temperature was 106. In Oregon it was 70! We had great weather the entire trip. The only rain we saw was in Arizona on the drive home! 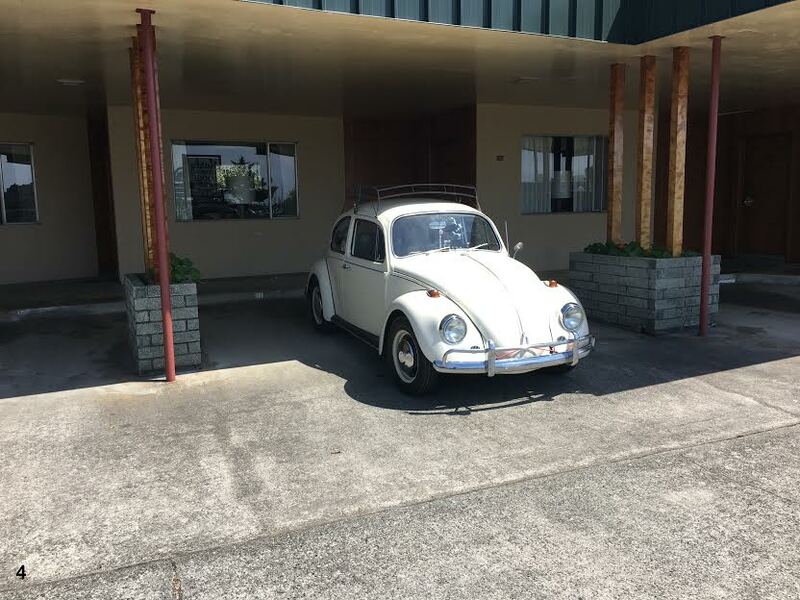 Our little Lotus White 1967 Beetle had 5,070 miles on the odometer when we left Vancouver. We drove from Vancouver to Astoria, Oregon, along the Columbia River. This first leg was just over 90 miles. 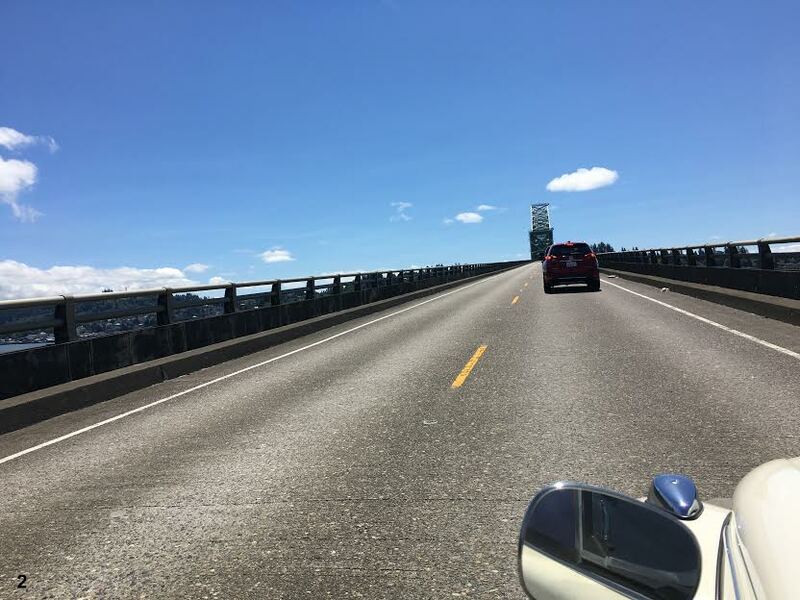 We crossed the Columbia River on the four-mile-long Astoria-Megler Bridge over the Columbia River. It is the longest continuous truss bridge in North America. Our first meeting of “the group” was in Astoria for dinner. Not knowing who or what to expect we all wore some type of VW shirt. It also was the first time we met “Buck” and “Andre” who were the contacts and leaders of the trip. They did an outstanding job. At some points there were over fifty cars on the road, a very impressive sight. Herding the group and keeping it together was not an easy task. It made for a few heart-stopping moments! The people and their cars were varied. There was an absolutely beautiful 1958 Bus. There was a 1969 bus which was exactly the opposite. Ugly, beat up and tired, but it ran very well. Some folks were retired, others teachers and some who just had chosen to drop out for a while. There was one gentleman who had done the Treffen every year in his Karmann Ghia! Several folks had done it a few times. It was apparent that everyone loved their cars and took very, very good care of them. The first day started with thirty-four vehicles. The number of cars changed every day. Through Washington and Oregon the number stayed around thirty. People from Seattle might spend two nights and then head home. Many went as far south as San Jose, California, and decided not to fight their way thru San Francisco! In Northern California, the number increased to fifty. In Half-Moon Bay, California, there were seventy cars. 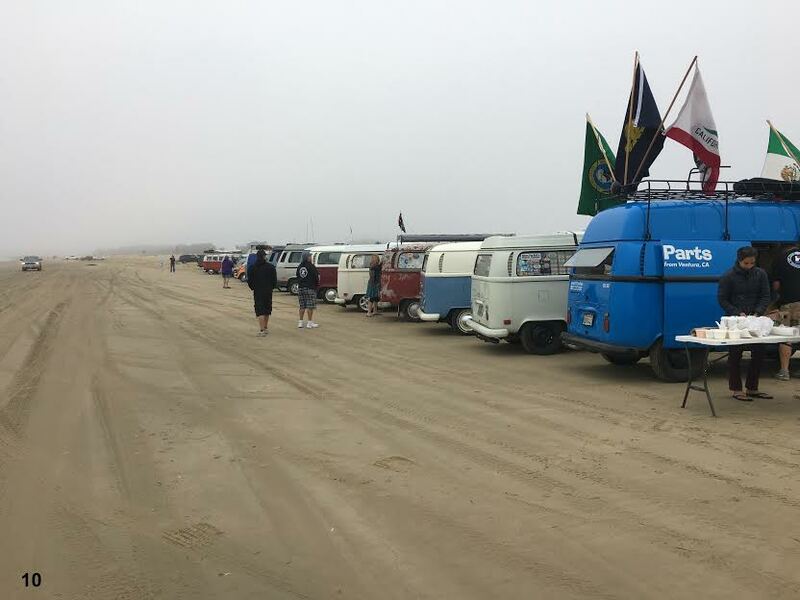 At Ventura, the number jumped to 100, and in San Diego there were over 150 VW’s. 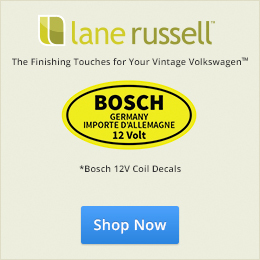 All types – stock, modified, Beetles, Buses, Square Backs, Ghia’s and even a Thing. Astoria to Coos Bay, OR, a distance of 235 miles. I think this was our longest driving day. Every day everyone gathered to discuss the plans and schedule. A fuel stop and a lunch break was always included. On day 2, lunch was in Newport, Oregon, at the Rogue Brewery. This was the first time we got to see all the cars together in the daylight. As you can see most of the vehicles were Buses. This was true for the entire Treffen. This was the only day in which we saw a serious road mechanical problem. A good friend provided some very good advice before we left–“Tighten everything.” It is good to have a real sage in your corner. Since this was our first day with the group it also was our first experience with the midday “pit stop.” You have not experienced calamity until you watch thirty plus cars all trying to gas-up at the same station in a very small one-horse town. I don’t think Florence, Oregon, ever has sold so much gas in one day. To dodge this experience, I gassed-up every night and avoided these pit stops. Coos Bay to Crescent City, CA, 165 miles and 61 sunny degrees. We stopped in beautiful Whales Head Beach for a picnic lunch. It is a gorgeous spot but a little difficult to get to. From the highway to the beach there is a very steep descent on a dirt road. Because there were so many cars a drone was used to sort and manage traffic! Some great aerial photos will be posted to their Facebook page. 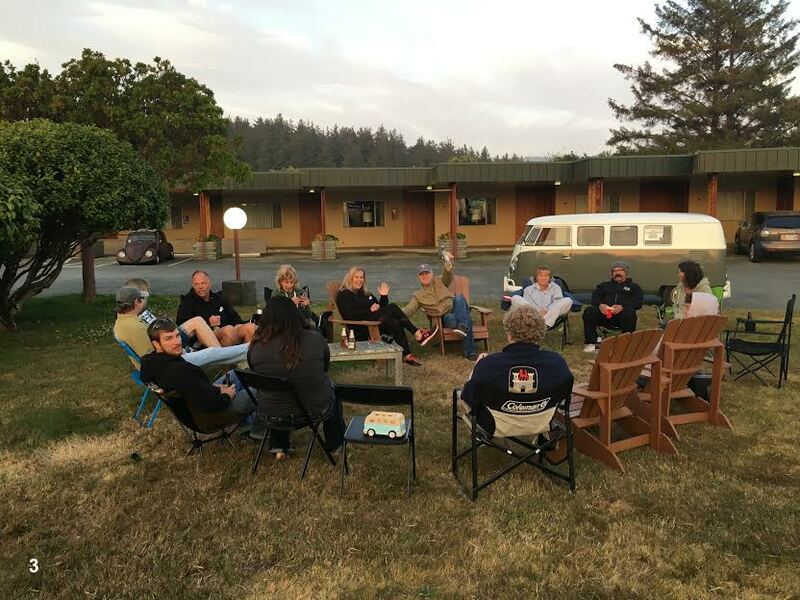 That afternoon California Auto Image hosted an evening BBQ and Vintage VW show in Crescent City, California. The Del Norte Dubs VW Club helped. I was surprised to see two other cars with Arizona vintage plates. The owners have winter homes in Arizona and, to avoid California’s strict vintage cars laws, registered their cars in the Grand Canyon State. The total number of cars jumped to over sixty. We stayed at “Curly’s Red Wood Inn” that night in Crescent City. This beautiful mid-century hotel was built from one, single, curly redwood tree that produced 57,000 board feet of lumber! This was the first time we got a group together in the evening for some relaxation and fun. We made several new friends from all over the country. There were two couples from Texas. There was a couple from Kelowna, Canada, who drove 500 miles to get to the start of the Treffen. They also had to drive home from the finish in San Diego too. A trip of 2,700 miles! They won the award for the longest distance driven. 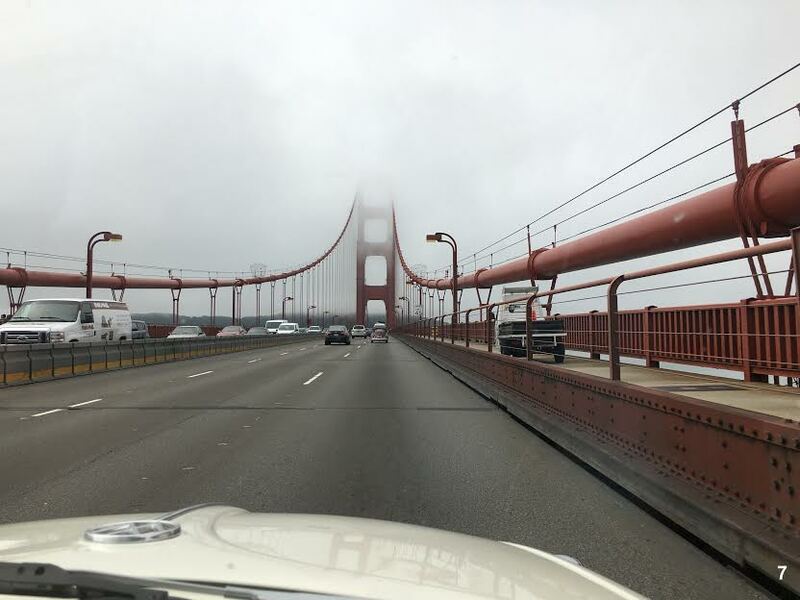 Crescent City to Garberville – 151 miles. Even though Route 1 along the Oregon and Washington coasts is beautiful, I had my hands full driving. The road is winding with steep descents and upgrades. I have gotten spoiled over the years and forgot that our beloved little cars are “full time” drivers. There is no laid back driving! Both hands on the wheel all the time. When the days were done, I was exhausted! Diane got to enjoy some of the scenery when she wasn’t wondering what was around the next hill or curve. This was a really unique day. We had a picnic lunch in Humboldt Redwoods State Park. Just a beautiful location. Even though we spent every night in a motel, many in the group camped out. The group could not have picked a more scenic spot to do so. So here we were in the beautiful “Redwood Empire” and I was experiencing the same issue. The car ran fine but second gear was a bit of an issue. I would grind it about 10 per cent of the time. I would then double clutch and it slid right into gear. This symptom is also a sign of a worn out bushing. The group was driving back to the coast and were going to be on some of the most technical roads on the west coast. We made the decision to find a shop and get it fixed. We left Garberville and headed down US 101. A beautiful road in its own way but not as scenic as the coastal route. This was the first time we encountered “California wineries.” It would not be the last either. One, which we passed, was “The Coppola,” which is owned by Francis Ford Coppola and has been featured on the Jay Leno show. Apparently Francis is quite a vintage car and wine buff. To make a long story short, the bushing had come loose, but there also was an issue with the metal cap which holds the shift spring in place! So a shifter lever was required. I had no idea that this part (looks like a hat) could come off. I like to say that I learn something about my car every day. This was a good example. 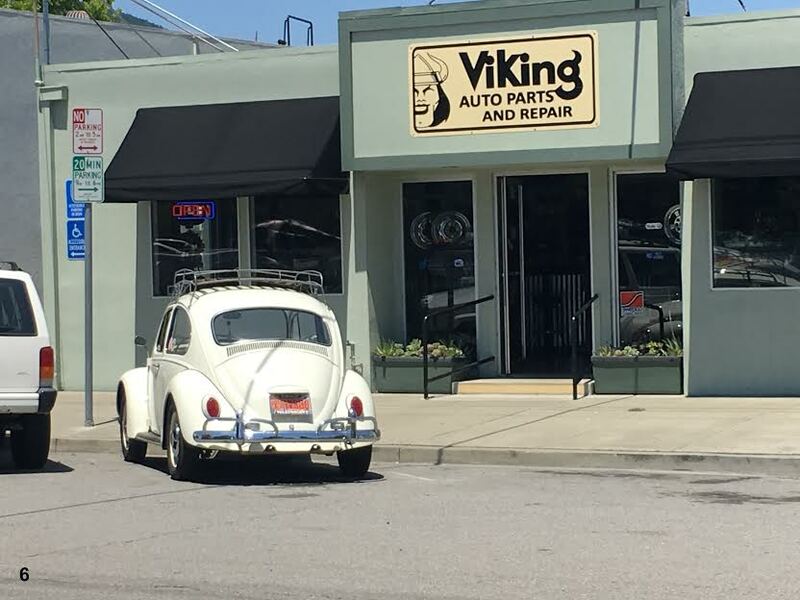 The good news is we found Viking Auto in Novato, California, which was highly recommended by the locals. This type of help was something which made the Treffen really unique. Someone always knew someone who could help. Viking Auto was one of the finest repair shops I have ever seen. It was spotless. The shop, the tool room and the office. Even their bathroom was “spotless.” Obviously this gave us a great sense of comfort and it was reflected in the work they did. It was also nice because Novato is a great little town with lots of places to walk to and eat. When finished, we headed north to meet the group in Santa Rosa. At Half Moon Bay was the first time we encountered people from the VW Corporate Office. 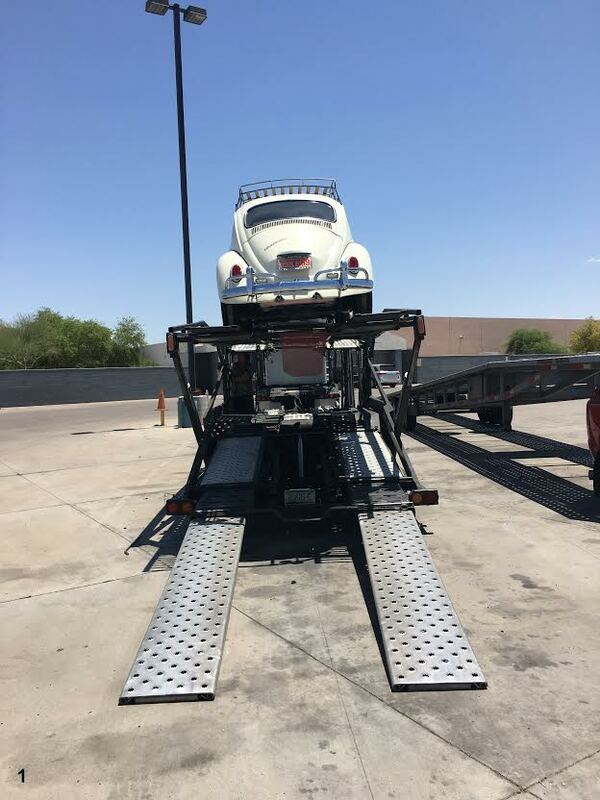 Apparently the word had gotten to them: “We have 50 plus vintage VW’s traveling down the Pacific coast. These are the cars which made VW. How about some support?” They sent a factory mechanic from Michigan. He was no ordinary mechanic either. He supports their vintage cars at the home office. I didn’t know VW had such a thing. They also shipped two vintage buses from Michigan to drive with us to Los Angeles. In Half Moon Bay we also met Joy, who has a beautiful 1967, and her friend Kathy, who owns a 1979 Convertible. It was nice to meet someone in person from our 1967 Community. 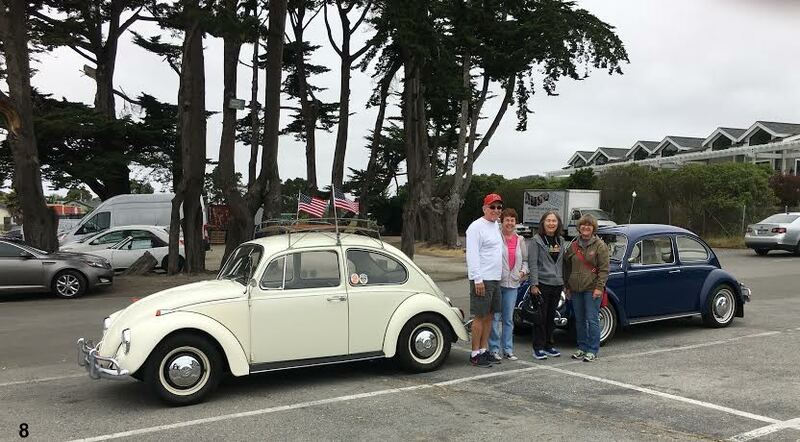 Pacific Grove was having its 3rd Annual Vintage VW Gathering in downtown on Lighthouse Ave. As most of you can testify, when you attend this type of function there always is someone who has a Volkswagen story! The stories and remembrances almost always involve a relative or college. There were approximately sixty vehicles on display. A few local cars from the Monterey area and some which made the trip from the Bay Area were there for the evening. Since it was the Monterey area a couple of Porsches showed up too. Those Porsche folks think they can hone in on any VW event! Pacific Grove to San Luis Obispo, 162 miles. This was a very interesting day. You may be aware that route 1 south of Pacific Grove and Big Sur is closed due to last year’s flooding in California. I was looking forward to this particular section because when Diane and I were first married we drove to Los Angeles along this route in my 1968 Beetle. I still have a picture from the trip! The group had to head inland on a meandering drive to reach US 101. As in Northern California, it was seemed that everyone in California owns a winery. It appears that those folks in California sure drink a lot of wine! Buck and Andre led the group across a very scenic, single lane bridge. They brought out the drone and did a great job of getting a video of every VW crossing the bridge. I can’t wait to see the video. As much fun as the trip had been to date, this was our most frustrating day. The daily “fuel stop” in Paso Robles looked like something from a “Fast and Furious” movie. 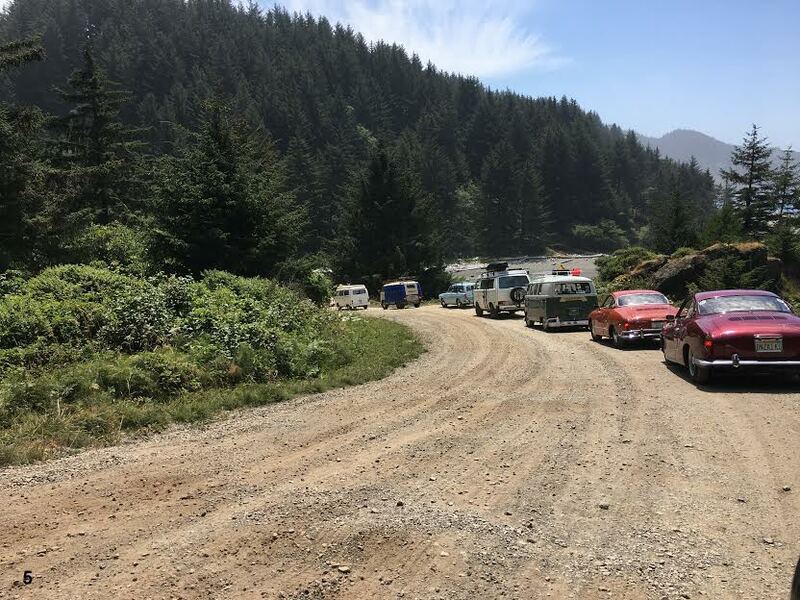 Sixty cars, three different gas stations, a county fair, a Toby Keith concert and the entrance ramp to highway 101–all at the same time and same place! We ignored the stop and kept right on going. We let them catch up to us down the road. It was a lovely day and we really enjoyed the cruise back to the Pacific Coast Highway. We rejoined route 1 just south of Hearst Castle and drove into the beautiful town of San Luis Obispo. Since this was a Thursday, it was “Farmers Market” night. Every restaurant and farm takes part either selling stuff or giving out samples. We parked the VWs as a group downtown and were in walking distance of bars, restaurants and ice cream! 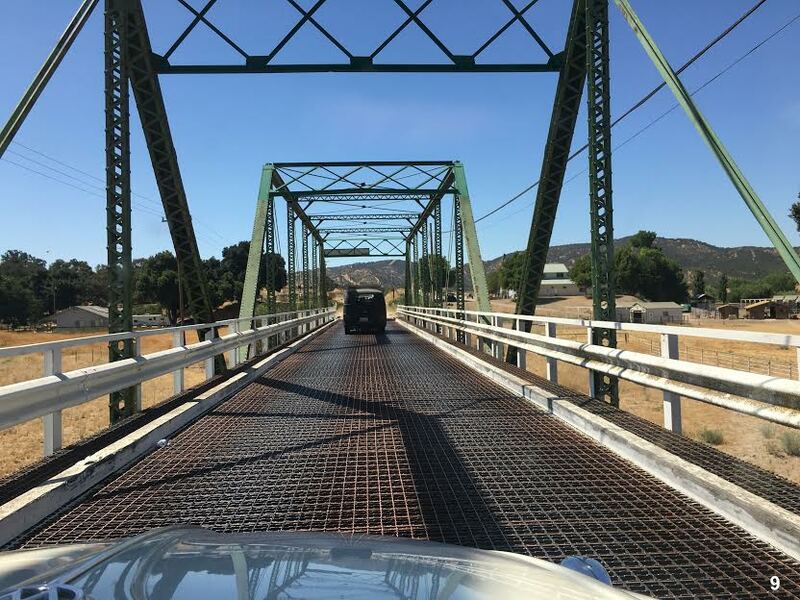 San Luis Obispo to Ventura – 140 miles. This was one of our shorter driving days. The guys had arranged to get all the cars onto the sand at Pismo Beach. It was safe and fun to drive our cars onto the hard-packed sand. There were not too many times we were able to see all the cars in one place. I counted sixty-four vintage VWs! Again, mostly Buses and Vans, but there were six Ghias and a few token Beetles. The pictures do not do the beach event justice. It was truly impressive. That evening the City of Ventura closed the main streets downtown and reserved it for vintage Volkswagens. There were close to 125 cool “air cooleds”. It was the first time on our trip I found 1967s! Five of them–four Sedans and a Convertible. 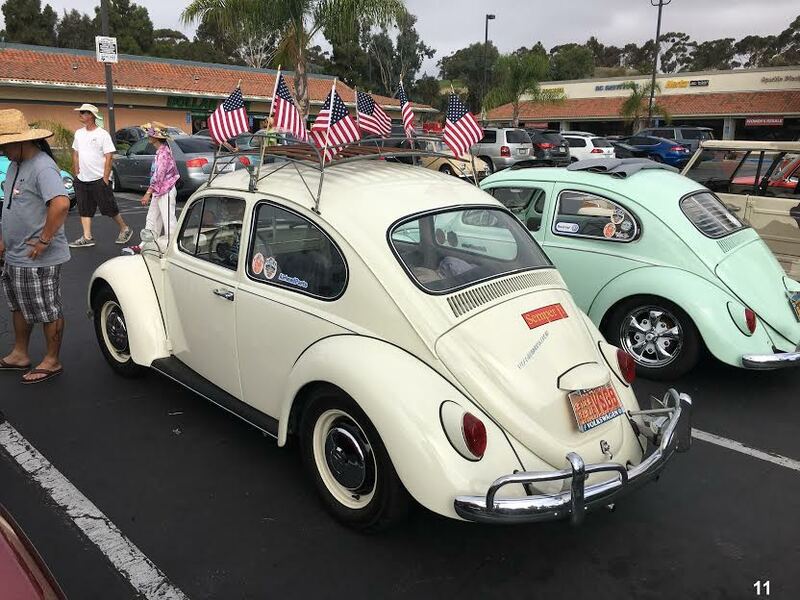 I found two of the owners, Chuck and Ann Bergquist and Robert Cortez and his wife, and made sure they know about the 1967beetle.com website. This is such a great resource and it felt good spreading the word. Robert and his wife joined the group and stayed with us to the Mexican border. The live music and dancing started at 7:00 in the evening and continued until 10:00. 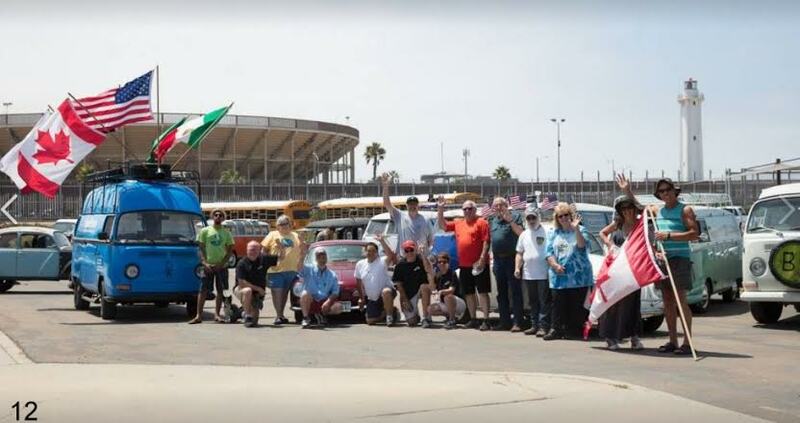 The VW Unlimited Club of Ventura helped to put the event together. Ventura to Oceanside – 140 miles. Diane and I originally are from Southern California and visit relatives there often. I was dreading this day. Everything they say about L.A. traffic is true. It’s fast and crazy. Somehow Buck and Andre managed to keep most of us together and we had an uneventful trip to the Automobile Driving Museum in El Segundo. A very interesting place filled with automobiles that would rival Jay Leno’s collection. During our tour, I was approached by a photographer from “Automobile Magazine.” He was putting an article together about vintage cars. He asked if he could take some photos of our car. The article may never get published but the attention we received was flattering. It made all the work and blood put into the car (plus a few dollars) seem worth it. On the drive to L.A., VW Corporate showed up again and were using “Go-Pros” to take videos as we drove down US 101. No one knows what VW will do with these images but the rumor was that it would be some sort of an ad campaign–perhaps highlighting the fact that sixty year old VWs still are on the road. Oceanside was the last night the group was together. Buck and Andre hosted a very nice event. We were talking to people whom we did not know a few days previously and were now sharing stories about kids, weddings and, of course, cars. The seven vehicles which made the entire 1,700 mile trip were acknowledged. We were one of the chosen few and the only Beetle. They prepared a little award ceremony and thanked everyone for coming. Oceanside to San Diego – 70 miles. Our last day. Border to border. Ten days and 1,700 miles! It is still hard to believe that we made this trip. A group photo was taken at Border Field International Friendship Park. These are the seven who made the entire adventure: Five Buses, one Ghia and our Lotus White Beetle. If you look closely you can see it hidden behind the group. Diane and I still had another 370 miles across 110 degree desert to get home. We already had decided to make it a two day trip. I set the cruise control at 63 mph, turned on the air conditioning and relaxed. Of course I am lying about the cruise control and air conditioning. We put beach towels on the seats, rolled down the windows, turned the vents in as far as they would go, wrapped wet towels around our necks and hung on. Total mileage for the trip was 2,135 and we averaged 32 mpg. I didn’t get that kind of mileage on the 1972 I bought new! And, we had no major issues. It was a fantastic adventure, but, no, we probably will not do it again! Thank you, Ron and Diane for taking time to record your emotions and details of the Cruise. We all wish that we could have been there with you! Previous: Previous post: Powder Coating — Is It Right For My 1967 Beetle? Outstanding story and pictures. What fun! Very good article. Jay and Eric bring us ’67 owners together. Since we live in Ventura County my wife Carolyn, daughter Arron and I always meet The Treffen in Ventura! It is an awesome event! I have always wanted to join the trip at the start! Great article Ron and Diane! Good article, guys! 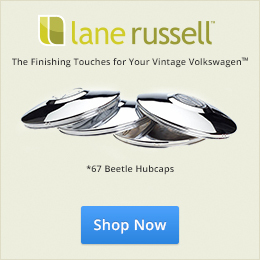 1967beetle.com exists for the community. Thanks everyone for your comments. I also want to let everyone know what a great VW community we have out there. There was always someone in the group who was willing to help others when needed. We could have used a few more Beetle’s and it would have been great to have some 1967’s! Maybe next year.